My husband loves taking photos of sunsets. He's not that fussed about where these occur, just as long as he can snap them. I knew, since we were road tripping close to the Grand Canyon, there was zero chance of me getting out of being dragged into the barren desert at least once during our holiday (twice, actually...) and made to hang around while Les amused himself photographing the fading sun. I, on the other hand, spend this time in the desert worrying about all the odd animal noises and trying to decide if coyotes and rattlesnakes are attracted by the smell of apple Chapstick. 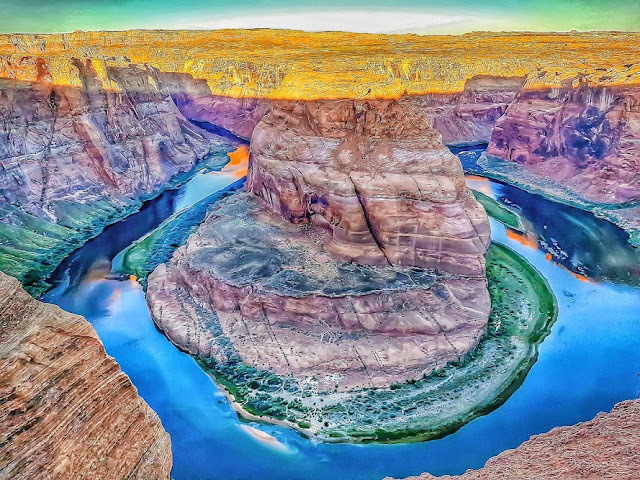 Anyway, my odd fears aside, Les decided that Horseshoe Bend, on the Arizona side of the Grand Canyon, was where he'd like to visit. Being the agreeable person I am (and knowing I could steal all his photos later on), I agreed. Also: it was on the way to our apartment in the town of Page, so I didn't really have a choice in the first place. Damn that evil genius and his mad mapping skills. 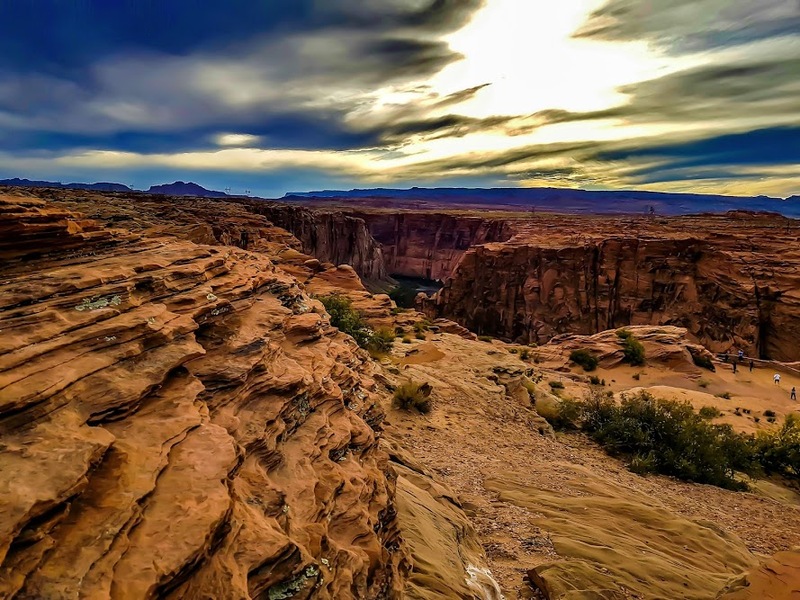 Horseshoe Bend, Arizona is a very popular sunset hiking spot and when we arrived around a half hour before the sun faded, the car park was already overflowing. I'm not a huge fan of Other People (Introvert alert...), so I wasn't overly excited about the prospect of sharing a romantic sunset with the population of a small city. We quickly decided (mainly due to the look of terror on my face), that we would give up in the whole sunset idea and go for sunrise instead. Surely everyone would be too lazy to get up at 5:45am to come down and watch the sun coming up? Thankfully, they were. We drove out in the dark of the early morning, sleepily making out way towards Horseshoe Bend and were thrilled to find just a handful of cars in the lot. We strode from the car park and walked the half mile or so down to the rum of the Grand Canyon. There is signage warning you not to wear sandals and these or flip flops are probably not a great idea. The terrain is very rocky and anything that might cause your feet to slide around in your shoes is best to be avoided when hiking. You don't want to be perfecting that selfie and end up taking a long dive for a swim in the Colorado River. OK, so maybe it was worth getting out of bed for. Don't tell anyone I said that, though. Signs also warn you not to stray for they trail, which is also a wonderful idea. It is very rocky and the trail is clearly identified by being the well trodden path covered in sand. 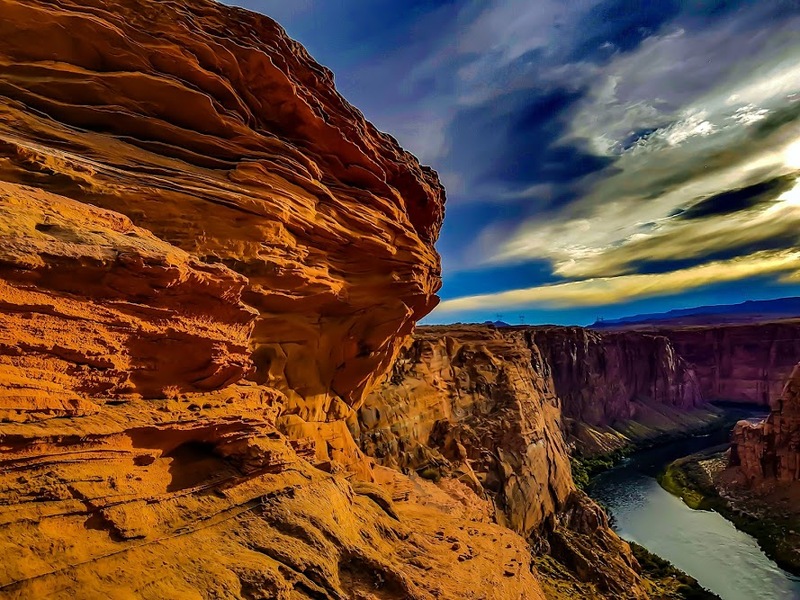 There are no barriers on the rim (would kind of spoil the view and the natural wonder of it all), so do be careful to consider your steps when getting close to the edge. Apart from that, and taking water if you're going during the day (it's hotter than hell; even in October), have a lovely time!! It was well worth getting up at such an ungodly hour to watch the sunrise change the colours of the red rock and watch the Colorado transformed into a green ribbon in the valley below. And, in case you were wondering, rattlesnakes and coyotes are not, it would appear, attracted to apple Chapstick. I can't vouch for any other flavour, so you'll have to take your chances. The USA has so many outstanding beauty spots to hike in (and drive through) which are the perfect escape from the stress of city life. They're also never quite as remote as you think. There's no bad time to visit the Grand Canyon, as well as the Smokies, rural New England (and too many other areas to name), although off seasons is not *quite* as hot as in the summer months and the changing leaves in spring and autumn are absolutely spectacular.